Curiosity's coverage of the 2017 eclipse is brought to you by Rocket Mortgage by Quicken Loans.Rocket Mortgage by Quicken Loans. Solar eclipses come around so infrequently, it feels like a historic event just to even witness one. But some eclipses from history have taken on a greater significance than the mere darkening of the sun. They've ended wars, inspired righteous uprisings, and proven scientific theories. Some have even intersected with major events in some of the world's biggest religions. Here are a few of our favorite stories about history-shaping solar eclipses. Obviously there have been eclipses happening as long as people have been on the planet. But not every one of them has made its mark on history. We're going way back to before people understood that eclipses were just the moon passing in front of the sun — and going all the way up to an eclipse that revealed a truth about the universe that was previously unimaginable. May 28, 584 B.C.E. – The End of a War: As recounted by Herodotus, a five-year war between the Lydians and the Medes would likely have raged into its sixth year and beyond if it weren't for an eclipse that had been predicted by the Ionians. As darkness fell over the battlefield, Herodotus says, "they ceased from fighting, and both were the more zealous to make peace." March 19, 33 C.E. (or maybe November 24, 29 C.E.) – The Crucifixion of Jesus: According to the Christian gospels, the sky went dark for three hours while Jesus was on the cross. That's probably an exaggeration, but there were two eclipses in the area at about the right time, and each of them would have lasted a few minutes apiece. Certainly long enough to make an impression. November 24, 569 C.E. – The Birth of Muhammad: The Quran describes an eclipse that preceded the birth of the last prophet, and modern researchers have been able to identify it as one that lasted three minutes and 17 seconds in the year 569. Another eclipse coincided with the death of his son in 632, but rather than attribute it to divine grief, Muhammad told his followers, "The sun and the moon are two signs amongst the signs of Allah. They do not eclipse because of someone's death or life. So when you see them, invoke Allah and pray till the eclipse is clear." August 2, 1133 C.E. – King Henry's Eclipse: This eclipse made a huge impression on the people of England when it cast its shadow for no less than 4 minutes and 38 seconds on the day that King Henry I sailed to England. It seemed like a dark omen — and indeed, Henry never returned home. Of course, this was only a coincidence, but what's undisputed is that, after Henry's death in 1135, England experienced a devastating civil war lasting more than 20 years. May 3, 1715 C.E. – Edmund Halley Makes An Accurate Prediction: Noted astronomer Edmund Halley (of Halley's comet fame) made history when he made an unprecedentedly accurate prediction using Newtonian gravitational laws. He got the time right to within 4 minutes — a few hundred years earlier, and astronomers would be lucky to get the right year. February 12, 1831 C.E. – Nat Turner's Rebellion: You might not think that the most successful slave rebellion in the history of the United States would have anything to do with an eclipse, but you'd be wrong. The devoutly religious Turner took the February eclipse as a sign to start planning, and when Mount St. Helens turned the sun gray-green a few months later, he took that as a sign to strike. May 29, 1919 C.E. – The General Relativity Eclipse: Albert Einstein became a global celebrity nearly overnight when his Theory of General Relativity predicted that when the sun was dark, astronomers would be able to see the light of the stars behind the sun being bent by its gravity. In one stroke, humanity gained a new understanding of the fundamentals of the universe. It's one thing to marvel at the ways that eclipses have intersected with human history, but what if you could actually see some of the eclipses that past generations did? Actually, you can. 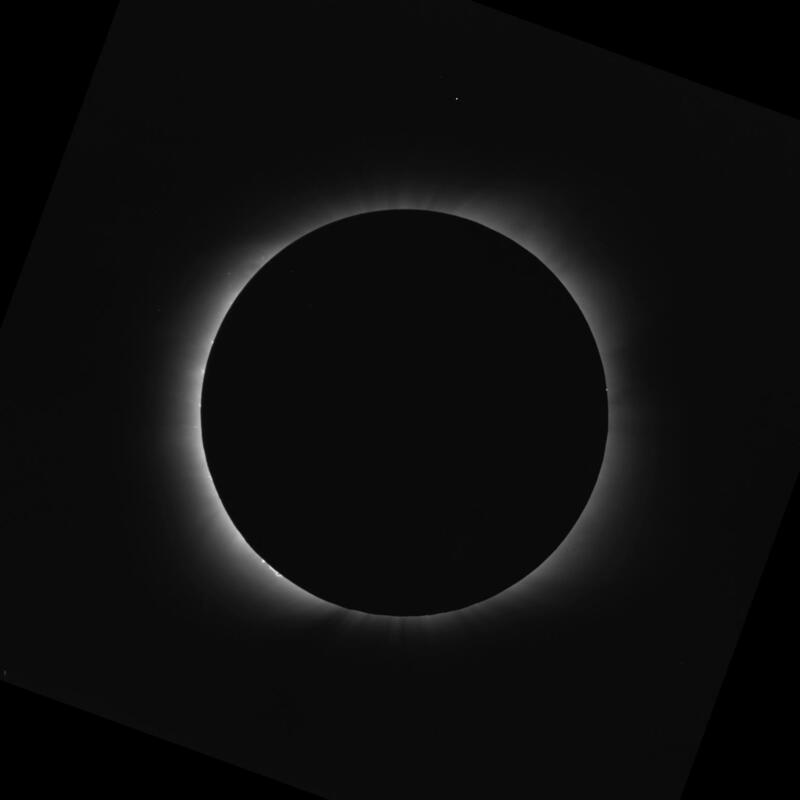 The High Altitude Observatory in Boulder, CO, is home to an archive of eclipse photographs going back to 1869. It's an incredible collection, and though Einstein's 1919 eclipse isn't included, the 1922 eclipse that reconfirmed his theory is. The older photographs from that collection have been processed using modern techniques, but one image that's perhaps even more impressive is notable for its clarity despite the relatively primitive technology. The very first photograph of a solar eclipse was taken by famed daguerrotypist Johann Julius Friedrich Berkowski in 1851. At the time, images could only be captured on copper plate, and only after long periods of exposure. So Berkowski had to time his shot just right — and when he did, he not only got the eclipse, he also captured the plumes of light of caused by solar prominences all around the rim. Want to learn more about the eclipse? See our other articles here. And to hear an astronomer give even more insights into the eclipse, check out our special podcast episode here or click below to stream. Why Is A Total Solar Eclipse Such A Big Deal?